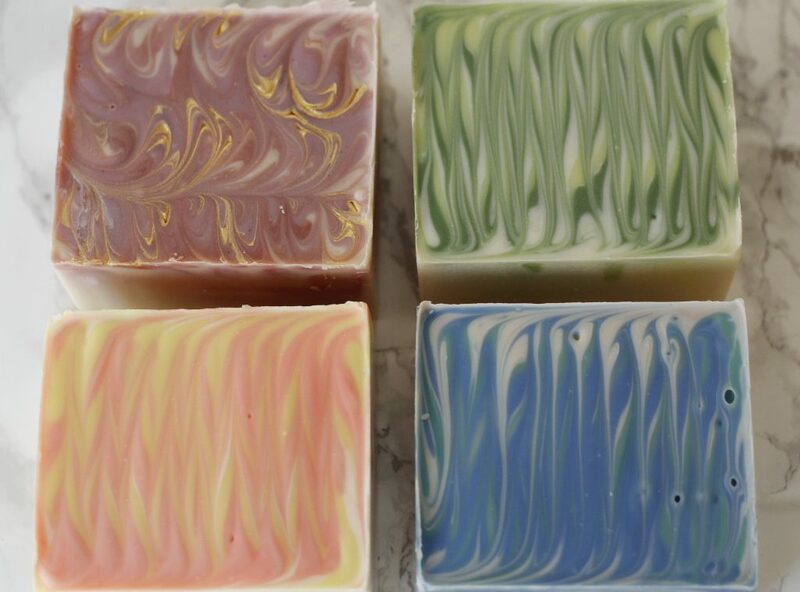 Don’t you sometimes wish you could just putter around all day and when inspiration strikes leisurely weigh out your oils and whip up a batch of soap? I do. But that’s not my reality right now and won’t be for quite some time. If I don’t carefully plan and prep my projects nothing would ever get crafted and that would be sad. When I’m planning to do a bunch of batches in the near future, I like to weigh out my oils all at once and prep my lye solutions ahead of time. That way on soaping day I can just grab the two and let the fun begin. Some call this process multi-batching, some master-batching – I’m not entirely sure what the difference is. I gather that master-batching is something that is typically used in big scale productions. It involves measuring out oils for multiple batches and then melting them in one giant pot. Out of this giant pot the soaper then takes out only the amount of oils she needs for the particular batch she’s making. The rest of the oils stays in the pot for future batches. This saves her a whole lot of time, because she doesn’t have to weigh every single oil out for each batch individually. The lye solution can be master-batched as well. I’m going to call what I do multi-batching since it’s on a much smaller scale. 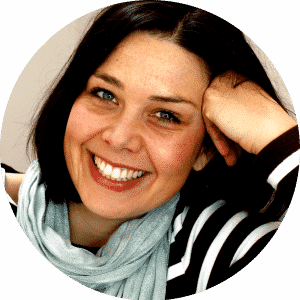 I find this process super useful for small batches – even very small batches. It’s really pretty simple, you just need to make sure you calculate all the amounts correctly. So, here’s what I do: I triple or even quadruple my recipe and weigh all of my oils into one big pot. After they’re all melted and combined, I pour the exact amounts of oils needed for the different batches into separate containers. Then, I go ahead and measure my water and lye individually for each batch. If you’ve read my article Soap Equipment I Wish I Hadn’t Bought you know that I’m a big fan of small batches. Today I’m doing 4 super small loafs (1 lb each) and you’ll see you can do all the cool fancy swirls just as well. 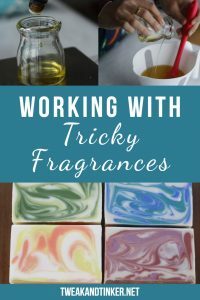 But besides knocking myself out doing fun swirls and using many different colors, my main goal was to test different fragrances I hadn’t worked with before. Acceleration: This is when the soap batter moves to a very thick consistency at lightning speed making it hard to work in colors and/or do intricate swirls. Fragrance oils and essential oils that are most notorious for doing that are florals, spices (like clove for example) and sometimes ozones (fragrances that mimic the scent of the ocean). This isn’t necessarily a red flag, if you have a few batches under your belt you can attempt to work with such a fragrance. Simply be prepared that the batter might move fast and adjust your design plan accordingly. 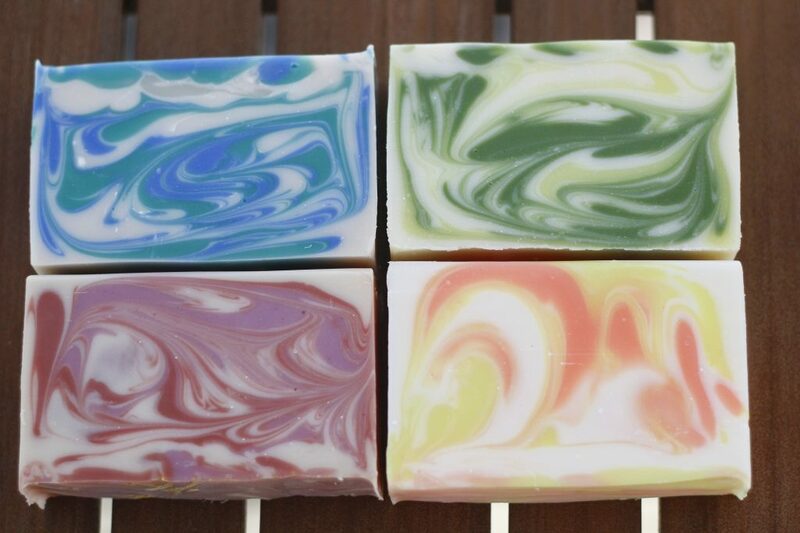 Good choices in this case are a solid color or a layered soap. Ricing: This is what happens when the fragrance oil binds to some of the base oils. The consistency really looks like rice pudding. The solution is to simply stick blend until the batter appears smooth again. The drawback to that though is that you might end up with a super thick batter from all the stick blending. Seizing: It’s acceleration on steroids. Some folks refer to it as “soap on a stick”. The batter turns into a thick, gloppy, clay like mess that is hard to move into your mold and hard to get of your stick blender. No fun. Discoloration: This happens mainly with fragrance oils that contain vanillin – often found in bakery scents. Discoloration can range from a light tan to a dark brown almost black color. Most suppliers will state whether a fragrance discolors on their website. 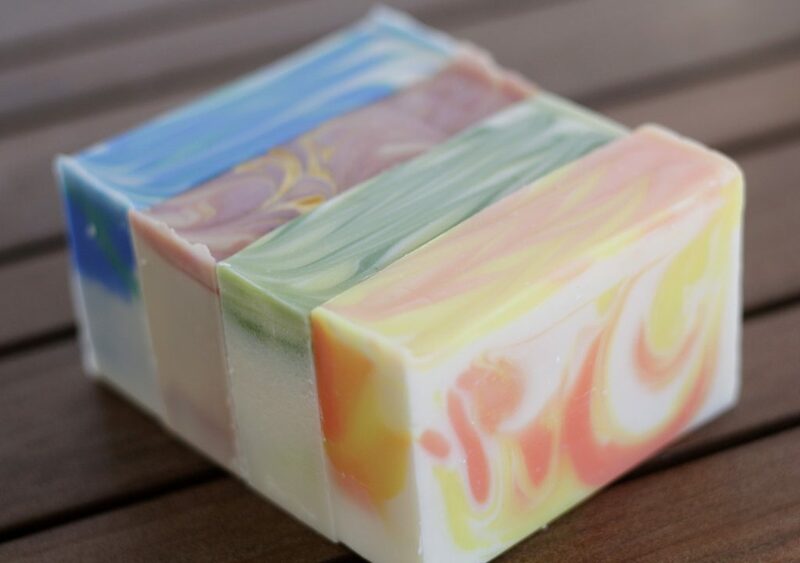 If you plan discoloration into your design, you can create beautiful soaps. 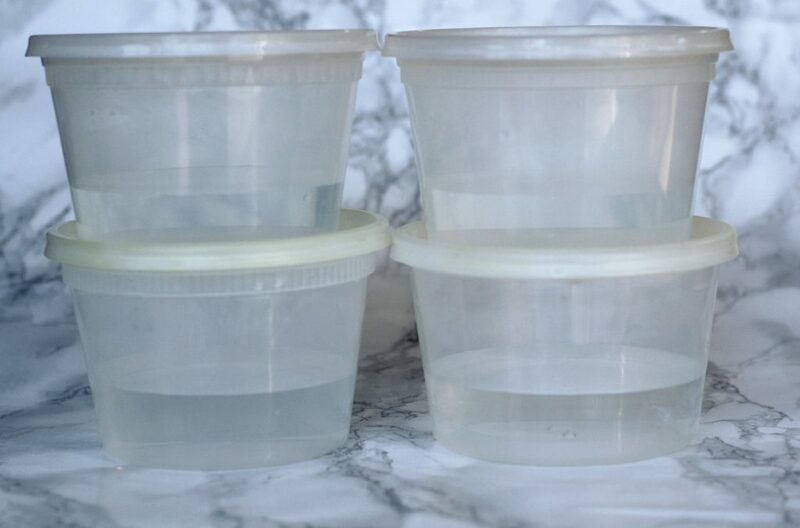 My go-to method when I’m working with a fragrance that discolors is to separate the batch into a small part, a little bigger part and an even bigger part. I keep the fragrance oil out of the smallest part and add titanium dioxide (TD) to it. To the medium part I add some of the FO and a little of TD and to the big part I add all the rest of the FO. Then I swirl all three parts together and get a cool tricolor effect. Gelling your soap will also intensify discoloration, and to combat this you can pop your soap in the fridge after you pour. Desceleration: It means the soap will actually set up more slooowly. Awesome, right? It’s just something that’s good to know, so you’re not alarmed and think something is wrong with your soap. After you’ve done your research it’s always a good idea to do a small test run. That’s what I’m doing here. I’m testing 4 different fragrance oils and I will take you along for the ride. 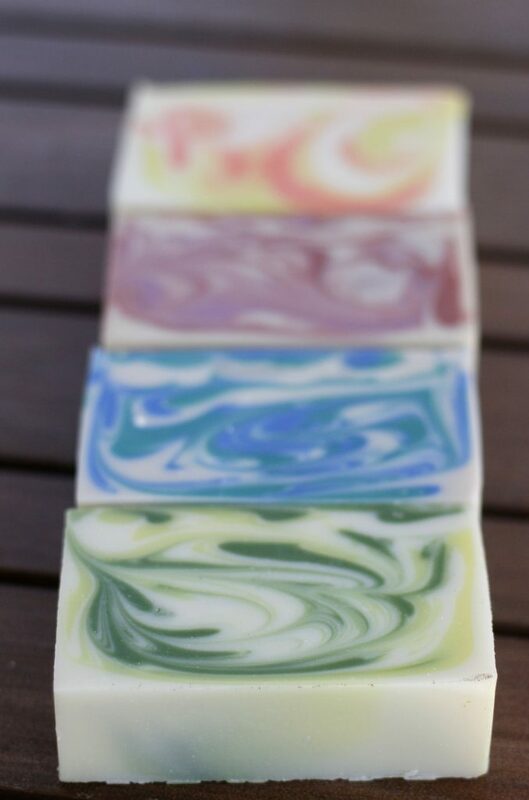 Of course, I’m sharing my recipe and all the colors and fragrances I used. This post contains affiliate links, meaning I will earn a commission if you decide to click through and make a purchase. 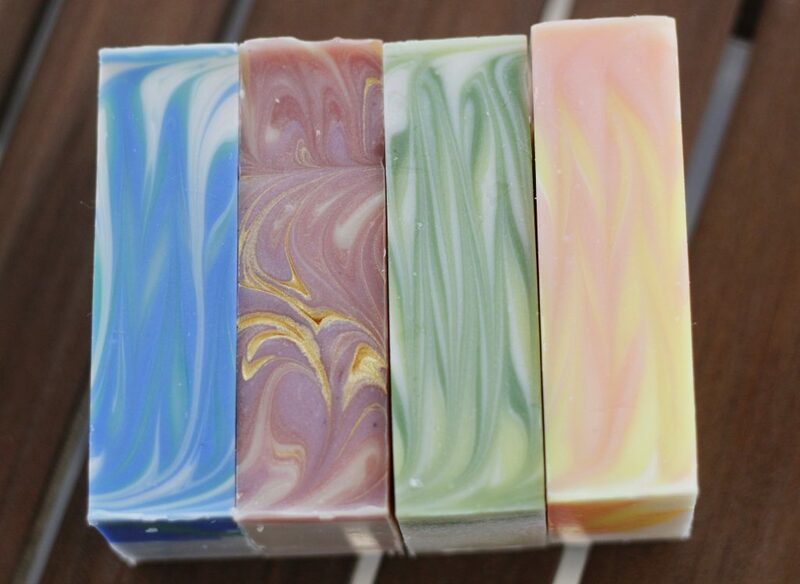 If you’re new to cold process soap making, I suggest you check out my articles on lye safety, equipment needed and my beginner tutorial. As I mentioned earlier I will measure and melt all my oils at once and then later separate the amounts I need for the 4 batches. 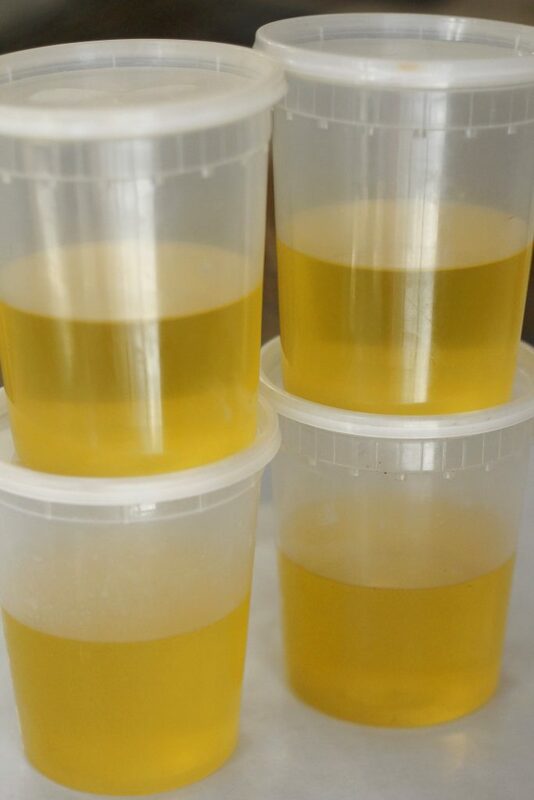 Lye: 53g / 1.9 oz. I have to say that all the fragrances performed really well. None of them accelerated, and only the Mona Lisa Fragrance Oil discolored a tad bit to a light beige after the soap gelled. Ohhhh! I want some of that yellow! I love how you described the various issues common with using fragrance oils. I also love your idea of multi batching! Brilliant idea that I might be stealing in the future!